One of the negative aspects of switching to Ubuntu is having to deal with the Nautilus File Manager. 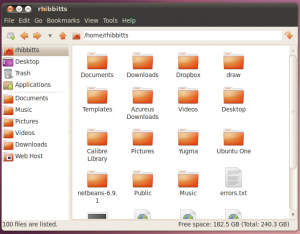 Nautilus is tightly integrated with Ubuntu, so it has some really neat features. For instance you can open FTP sites in Nautilus just like any other folder. However, Nautilus is notoriously SLOWWWWW! I mean it can bring you to a screeching halt. Plus, I’ve been having issues lately with it just crashing, then I have to re-start Nautilus from a terminal. So, long story short (too late!) I’ve installed PCmanFM, which is a lightweight, speedy file manager with plenty of bells and whistles. Now once PCmanFM is installed it would be nice to have it integrated with Ubuntu, be the default file manager etc… So here’s a simple way to replace Nautilus with PCmanFM WITHOUT having to completely remove Nautilus. Replace the MimeType contents from pcmanfm2.desktop with the MimeType contents from nautilus-folder-handler.desktop. 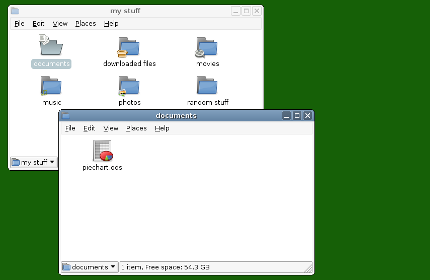 And your default file manager should now be PCmanFM instead of Nautilus. It works on the desktop and in the Places menu, although some applications may call Nautilus directly.